Take MyaBèl home with you into your own kitchen with these craft sauces & condiments. Everyone is a cordon bleu with MyaBèl. 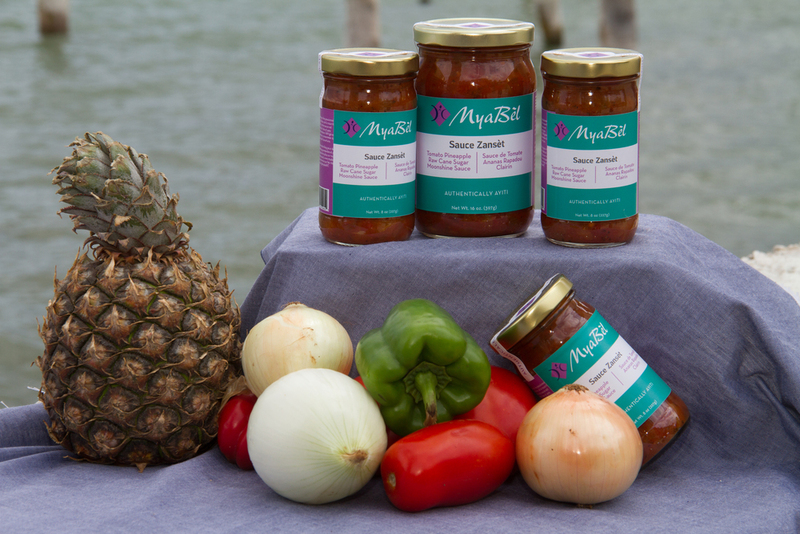 Easy to use, flavorful, and Authentically Ayiti. Passion fruit and ginger mixed carefully to produce a mixture that goes with everything! Use on ice-cream, cakes, seafood, meats, vegetables or as a dip. To dilute for savory dishes, add 1-2 oz. sauce to 8 oz. meat or vegetable stock. To use on sweet dishes, pour as is. Ay! Ti Manman, that tastes good. This spin on Haitian spicy slaw called “Pikliz” [pee-kleez] incorporates our tasty Haitian mango, to balance sweet and spicy. Use it as a condiment on dipping chips, pressed plantains, or to spice up vegetables or meat. A tomato and pineapple based sauce; this zesty salsa is named after our wise ancestors for its basic almost primitive ingredient composition. Use it as a dip or dilute it with meat or vegetable stock to flavor your favorite staple dishes. Check out recipes here. Ingredients: tomatoes, pineapples, onions, vinegar, olive oil, molasses, moonshine, honey, spices.